Why do we tense up in response to stress? Tension makes us feel stronger and more present. When we are relaxed, we feel that we are like vapor, drifting away. Tai-chi teaches us that we are more effective in defending ourselves when we are relaxed. Let the opponent fight a vapor rather than a solid object. When relaxed you can be quicker and more effective. If the situation is not physical, such as a verbal argument or a life situation, staying relaxed will keep your mind clear and you will react more creatively. But how can we learn to stay relaxed when we are so programmed to tense? Imagine a “black hole” (a collapsed star) that is so dense that even light cannot escape from it. If the entire earth were as dense as a black hole it would be the size of a peanut. So in comparison to a black hole, we are not very dense. We are almost not even here. We tense (become more dense) in order to “feel more here” so we can be more formidable. 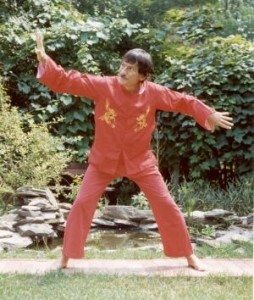 Tai-chi teaches us that our vaporous nature also has power. It teaches us how to use the power of relaxation to get through life more easily. The nature of a black hole with its immense gravity, is to pull everything towards it, to grab, to own. The nature of vapor is to merge with everything around it and to become part of the world. Chi-gung, forms, push hands and Tai-chi bodywork are all designed to teach you the value of fluidity, the value of empty space within you, the value of merging. Internal space is defined as the ability of each joint and muscle to move. Even though the form is quiet, with minimal external movement, there is a free flow of internal movement, like waves flowing through the body. This is the healthiest state of the body and it allows a relaxation of the mind and emotions as well. Embrace your fluid state and learn about its power. Our dvd series, “How to Learn and Teach Tai-chi” discusses these ideas in detail. (See http://store.movementsofmagic.com/howtotetavo1.html for more information). In my opinion, tension is a natural phaenomenon which indicates that the brain is in conflict with the autonomous nervous system or/and with itself. When we get angry, the brain orders our weapons (hormones) to be prepared for action, but it also imposes an order which forbids the lower officers of our army to act individually. It’s like pushing the gas pedal and the breaks of a car simultaneously. In Tai Chi we often forget the Chuan. Practicing relaxation should serve the Chuan and the Chuan should ensure the brain that we have the right to relax. The measure of our success will be our ability to enter into difficult situations with a kind of relaxation full of presence and assuredness.